Perfect ravioli. Photo courtesy of Lime Wood Hotel. We sent London-based contributing editor Malika Dalamal, a woman who loves to eat but doesn't know how to cook, to the English countryside on a mission. Could she learn to cook from one of England's best chefs? HAMPSHIRE, England – Let me start by confessing that my cooking extends as far as quinoa salad and chocolate chip cookies (from a mix). 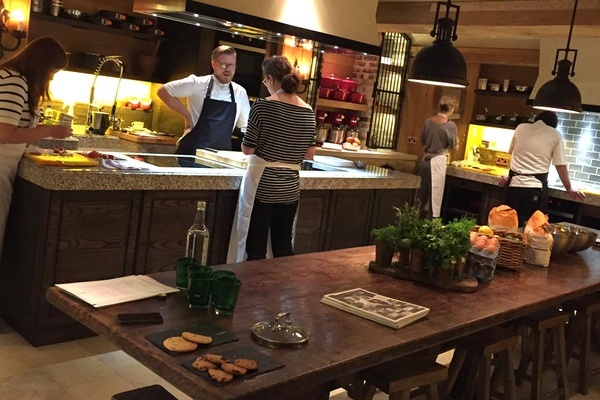 So you understand why I panicked at the suggestion of trying out the new cooking class at in Hampshire run by , Michelin-starred Gordon Ramsay protégée and chef-owner of in London's Mayfair, and resident hotel chef Luke Holder. I imagined spending an entire day burning things and being yelled in a stuffy Cordon Bleu-style class. But in the spirit of doing what scares you — and mostly because I wanted to spend the night at Lime Wood, a stunning country spa hotel on the edge of the New Forest — I found myself on a the two-hour train to Lyndhurst. (named after the hotel's Anglo-Italian restaurant, Hartnett Holder & Co) is definitely not the stiff cooking school I was expecting. Ian Longhorn, our head chef and teacher for the day called it "fun dining, not fine dining." There is no blackboard with students gathered around taking notes while the teacher demonstrates. Instead, this is real cooking — informal and unpretentious. No dry ice or decorative smears on the plate. They offer classes based on food you really want to cook (and eat). Full-day sessions last from 9 a.m. to 5 p.m. and cover pasta and risotto, fish and shellfish, game, or even an entire Christmas meal. They also offer half-day morning or afternoon classes where you can learn to make the perfect afternoon tea or canapés for your next party. In the learning kitchen. Photos by Malika Dalamal. There are seven of us in the Seasonal Entertaining class (classes can hold up to ten) and our lesson is a three-course meal for a dinner party. We're in a slick, purpose-built kitchen, which somehow makes cooking seem a lot easier than it is at home — perhaps because we don't have to wash anything up. 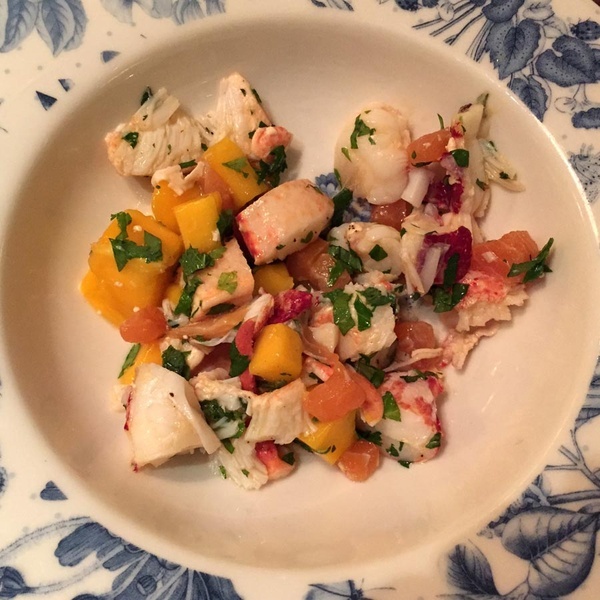 First on the menu is a lobster and mango salad with chili, coriander, and smoked salmon. While Ian explains that the most humane way to kill a lobster is apparently not to boil it alive but to submerge it in ice cold water until it is comatose and then stab it through the brain, I search frantically for a partner who looks like she would be willing to do this to our lobster. My search is in vain as we are all handed our own fresh lobsters to murder. Knife in hand, I panic, mumble something about being a recovering vegetarian and convince Ian to kill mine for me. Lobster salad, before and after. Feeling like a wimp, I vow to pull myself together. Surely the lobster was the main attraction and it will be all chopping vegetables from here? Not a chance. 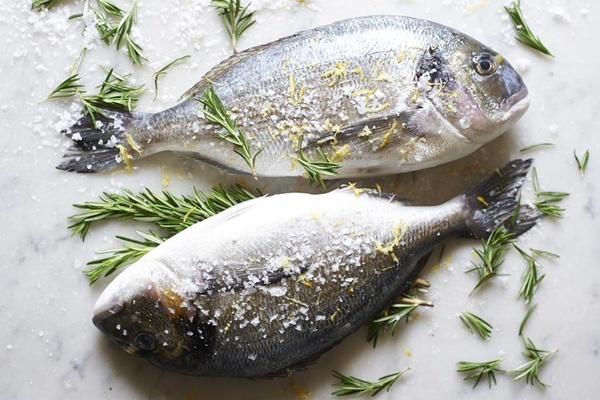 A tray of gleaming sea breams arrive ready to be dissected. I realize I can't pull the damsel in distress act twice in twenty minutes, so I get to work: chopping off the head, snipping at the fins, slicing off the fillets, and picking the bones out with fish tweezers. (Yes, they're a thing apparently.) I'm left with two perfect boneless fillets and am suddenly feeling elated, confident and ready to apply to MasterChef. 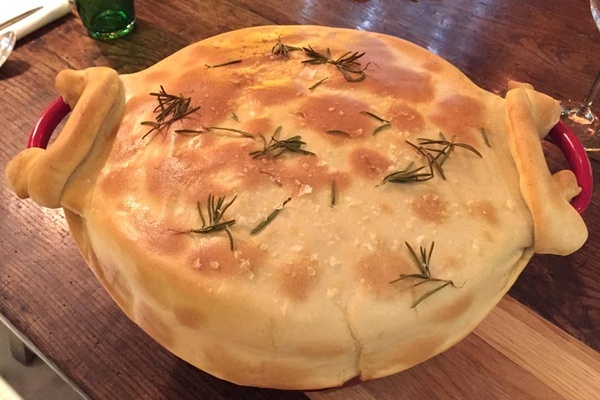 The fish becomes a most impressive looking casserole with tomato sauce, truffle butter, and lobster bisque baked beneath a layer of rosemary flatbread. Yes, I did this. We eat it for lunch, along with our lobster salad, at a communal table in the kitchen accompanied by wine picked out by the hotel sommelier. Sea bream casserole, before and after. Top photo courtesy of Lime Wood Hotel. After lunch, still on a high from filleting the fish — or perhaps because I am slightly drunk — I nearly stab myself while splitting a vanilla pod and manage to mess up my buttermilk panna cotta by adding water to the mix. By the time the esteemed Angela Hartnett arrives in the afternoon to show us how to make her famous "rich man's pasta" from scratch, I'm amazed at how much I've learned in a day and am genuinely sad it's nearly over. (Angela's afternoon pasta workshop was a one-off, but she also teaches her own classes.) 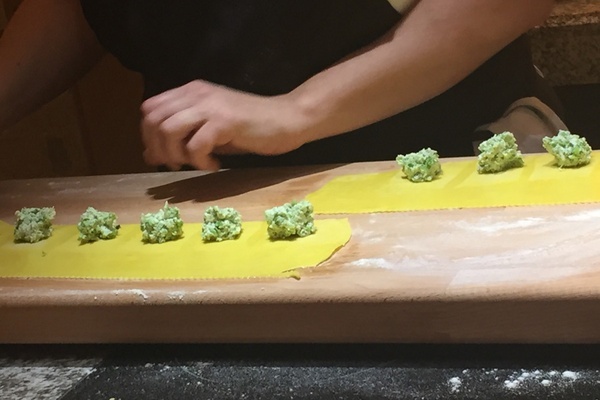 Using nine egg yolks mixed with flour, I make fresh pea and ricotta ravioli, farfalle, and tagliatelle on a pasta guitar, a contraption I never knew existed. I pack it all up and rush home to show off to my husband. I make him ravioli with tomato sauce for dinner. It explodes in the pan and turns into a green and red mushy mess. He eats it anyway, happy that it's not quinoa salad. Topic-specific classes — meat, parties, cakes & pud, classics, and veg — are offered continually. 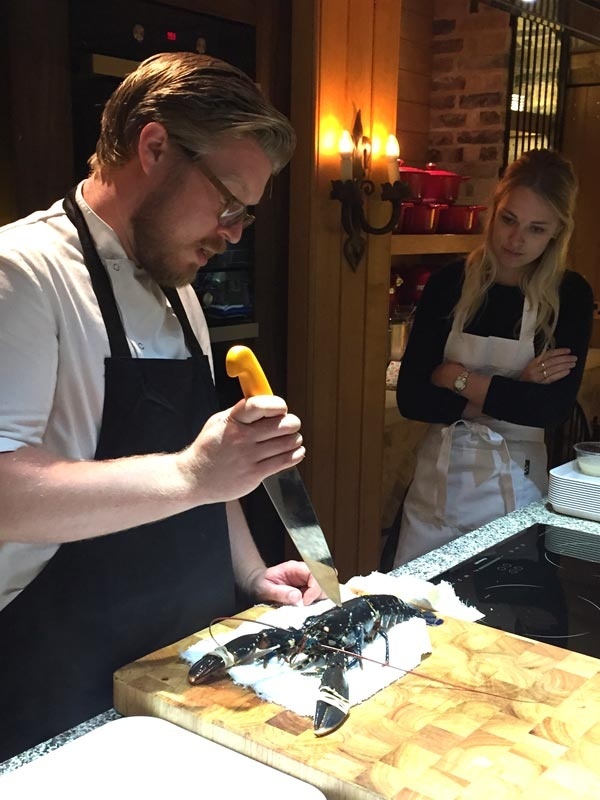 Guest chef classes feature Gizzi Erskine, Sabrina Ghayour, and Mitch Tonks. 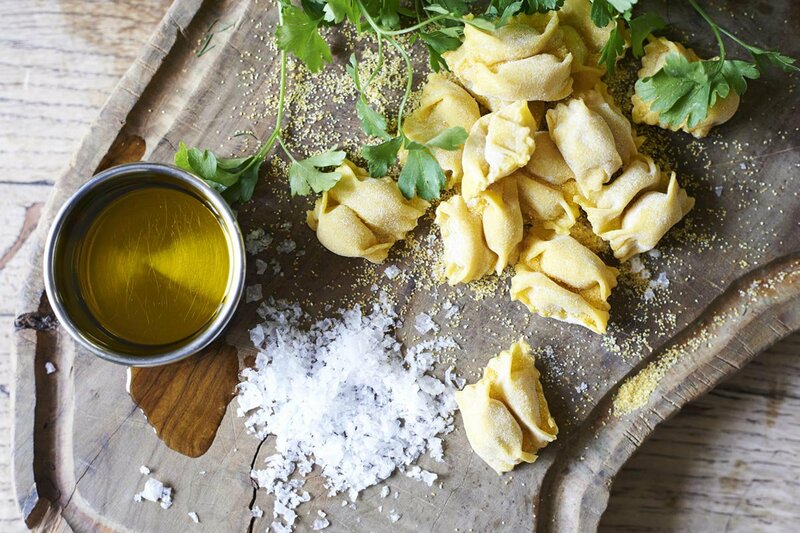 Angela Harnett leads pasta and risotto classes at least monthly. for details. The hotel is approximately a ninety minute-drive drive from London if you're going by car. Otherwise, it's a direct, two-hour train ride from London Waterloo Station to Brockenhurst. A taxi from Brockenhurst to Lime Wood is £12 and takes no more than ten minutes. В интеренете нашел полезный блог с информацией про showroom-kiev.com.ua.